On Sunday, we played devil's advocate a bit and tried to tear down the preferred count. We'll continue watching the alternate possibility presented there, but we're going to focus on the preferred count until the market suggests we shouldn't. The preferred count continues to believe that the market is in the early stages of an important trend change, and I've assembled some additional supporting evidence in favor of this view. The first chart I'd like to present is the London FTSE, which has now overlapped its potential first wave. While this doesn't rule out higher prices in the future, it does substantially lower the odds on any long-term bull counts. 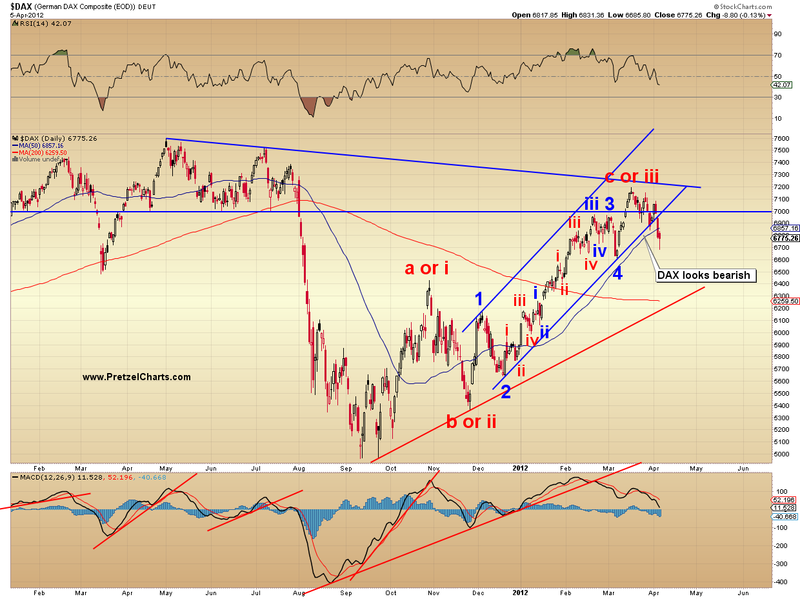 Next is the German DAX, which also looks bearish. It appears that the preferred count for DAX, presented a couple times over the past month, did a good job anticipating the turn in that index. Silver appears to be breaking down from its uptrend. Next a look at several indices on the same chart. 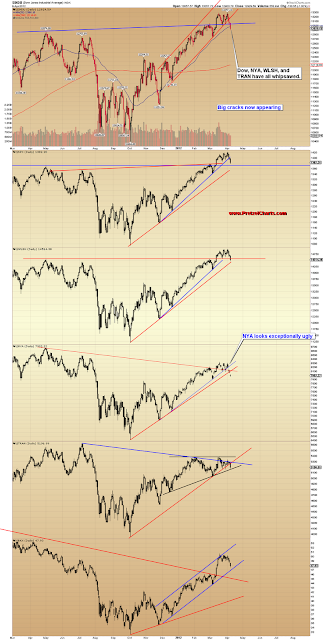 NYA, WLSH, TRAN, and INDU have now all whipsawed their recent key breakouts. Let's take a quick look at the preferred count in the big picture view. Keep in mind that the next bottom (blue target box) could mark ALL OF wave (i), or only mark the bottom of wave 3. 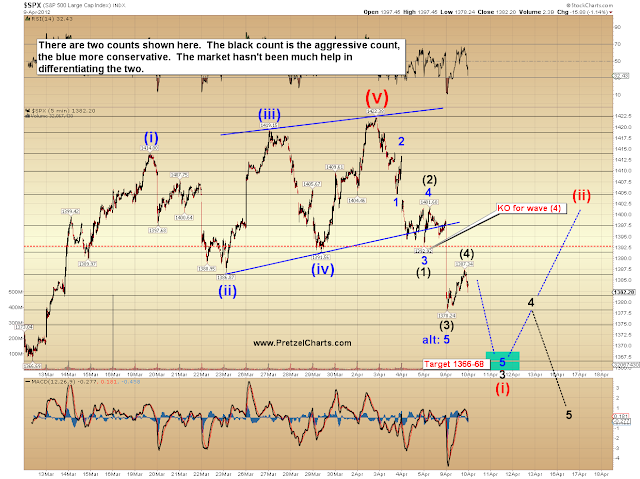 The same count, shown on the 5-minute chart below. Trade above 1392.92 would eliminate the 4th wave interpretation and indicate that a correction at higher degree was unfolding. Finally, a look at the alternate count at next highest degree. The first target under the terms of this count was reached yesterday. 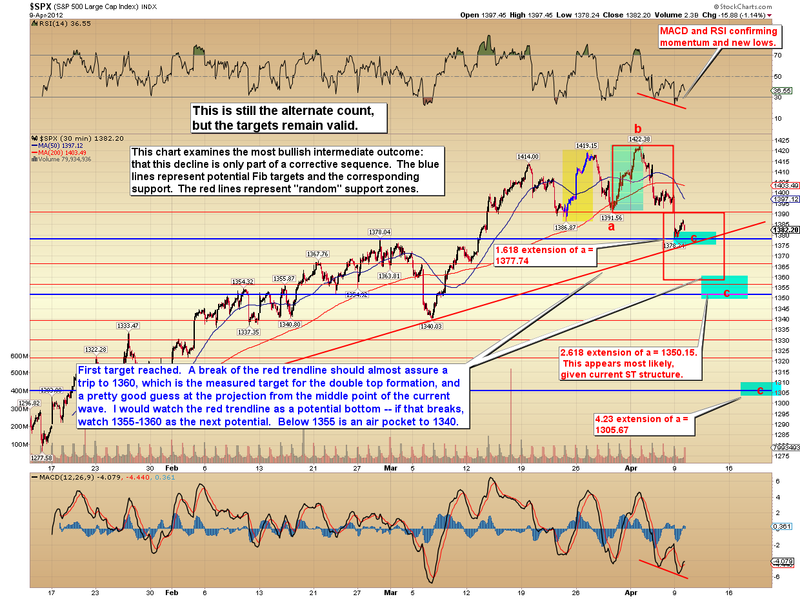 The 2nd target below might line up with the black count shown in the chart above -- however, the market is reaching into territory where bears need to be very cautious of a larger rally developing. If the first target below is exceeded, and the second target missed, that might argue a bit in favor of the preferred count. In conclusion, there are even more bearish signals appearing across markets, adding some degree of confidence to the preferred count. Unless bulls can pull a major stick save here (wouldn't be the first time), it appears that a larger trend change is beginning. Trade safe. will win; if not you are shooting in the dark. Good morning. PL, riddle me this - this chart already shows break of Oct 2011 trendline log scale. Morning PL - Europe's obviously read the post because its all in the red!! Thanks PL for another awesome post....seems like were at significant crossroad. I'm just sticking with cash, and paper trading until a path is chosen. Fortunately you guys have a better onboard GPS than I do...Mine is saying, "turn right, then turn right....recalculating." Could be either direction from here. We're in between trendlines on the RUT with round number support on 800 favoring a bounce as the preferred possibility. The market loves curveballs as evidenced by the trendline breaks of late, so maybe the alternate possibility will unfold. We have a left shoulder and a head....hmmm....a desperate right shoulder would be interesting. Good morning, you recently asked about mid April astro signatures. Sorry, about the delay - I've been traveling. Mars turns direct on Friday 4/13 11:22 pm EDT. The Sun opposes Saturn on Sunday 4/15 at 2:27 pm EDT. There is a good correlation to potential ST-IT trend change around these events. Since Mars turning direct is slow to gain momentum from our geocentric perspective, we should allow several days for the energy to build. If the market is still correcting down into these events, I would pay very close attention to trendlines, support levels etc. Mars has been retrograde since 1/23/12 - anything that has required action will now have more favorable energy to move ahead. Good morning Furrr. Is this astro signals stuff something that you take seriously or is it just something you just consider for 'fun'? If you do take it seriously, how reliable do you find it to be? PL.....I have significant admiration for you on three points. 1. Fair & Honest.....every post I've seen here has clear and concise "potential outcomes", choices. I only know a few people with the ability to be this objective. 2. Helpful & Compassionate....even when we newbies question your thinking or ask for clarification regarding EW or TA, the tone of your text is instructive, supportive and never condescending. Motivational comes to mind. 3. Experienced & Humorous...even though you have the ability to trade daily with little "noise" from the peanut gallery you still choose to share your knowledge with us peanuts and often in humorous fashion. Laughter is the best medicine when we newbies start taking things to seriously. John F. Kennedy said in his inaugural speech "civility is not a sign of weakness, and sincerity is always subject to proof" The first part is you all over, but the second part...just doesn't apply. PL, good post, thanks. On another note over the weekend I ordered Prechter's book through your link and my wife added something else to the order too. Thank good doctor....you've provided medication for what ails me. I marvel at your ability to read Ichimoku tea leafs. One of the financial astrologers I follow has called most of the major trend turns as accurately as PL - I find astro signatures in correlation with EWT to be excellent in combo for anticipating market direction. That said, the run off of the November bottom (an eclipse date) has been unusually defiant of ST astro reversal signatures. We have had turns of only a day or so. The extra liquidity in the system is directly related to the strength of Jupiter in Taurus - which I have addressed before. The upcoming signature we are most watching is the June square between Pluto and Uranus which has a strong correlation to major events - this square was last present 1932-34. When I have some more time, I intent to post more info and charting around this event. A good identifiable ES run -- EW3 or 5 -- is about 7 points in ES, I do not know what it is in TF. Try to determine that by relating a move to ES. Out of that ES run one should get about 5 points (or the entire seven if you hit the top and bottom correctly, I then to get greedy and think it is even going lower, lol). Five times 50$ per point equals 400$. Put your TLs on ! It is like filling up a gas tank, when that is reached, the nozzle shuts off and mrkt chop is usually ahead. I'll read it later, but it must be good. :-) ,, And thank you in advance for all your hard work. Good morning Apple. Is that another green candle you have? PL...not sure why, but I am not getting queries or updates via Disqus. Several questions asked by others in the last two days postings have not come through to my email. Can you suggest a course of action here to remedy this? Thanks K7...TF was so easy yesterday, but I was not trusting the TLs. It was tooooo easy...I scared myself into bailing too early by getting suckered by the stalls. I wasn't trusting the TL "fence", but the fibs worked out beautifully. I'm still getting used to actually believing what my eyes tell me, rather than the usual over-thinking it. I'm getting better though every day. EW still mushes my brain though...I'll get it soon. Kudos to you on the TVIX moves though...impressive. I guess all things are inter-related. I'm having trouble deciphering Ichimoku lines...so I'm gonna rely on you for Astro interpretation. Thank you!!!!!! You are helping the sheep survive amongst the wolves. PL is a rare gem indeed. Another outstanding angle to be looking from Pretzel. Thanks again. Before I try to add a comment with any links PL, do you mind checking to see if you can find some of my comments from yesterday in the spam bin? I just could not get a comment to 'stick' here yesterday if it contained any link whatsoever. Interesting that you focused on Europe today. Last week Chartrambler an I were talking about the same topic and although I had been focusing on Germany and how the DAX looks relative to the entire Dow Jones European Financial Index, CR pointed out that he thought the FTSE was becoming the canary. I took another look at it and concurred with him. The aspects that you point out this morning on the FTSE (which I hadn't noticed) pretty much cements the notion that the once darling FTSE is almost looking like it might be the first mosquito to try out the new zapper. On that DAX issue... I'd love to drop off a link here on a study I did quite a while ago that shows how the DAX is surging and surging relative to the European financial district. In other words how stocks had basically been on a rocket ride while the banks who were funding it were collapsing all around it. Clearly that's not a good situation nor one that can go on forever. So I've been looking for cracks in that dam and they're now forming. That's what I'd like to share with your readers today if I can. But if I add the link, this comment will vanish. Yesterday I had to give up after 3 tries. Hopefully you can help me out with this problem, that comes courtesy of another site. Thanks PL. Have a great day folks. For what it's worth, if the market heads lower today, which I expect, I'd be surprised if it didn't bounce off 1370. But ultimately I still think 1340 is probably a real serious level that needs to be tested. Truly.....your picture tag is familiar Rob. Where have I seen that before? Anyone long in AAPL right now? Nerves of steel. At this very moment, if AAPL were up exactly the same percentage as the NDX itself, then the NDX would be exactly flat. Another way of looking at is that the entire gain in the NDX at that moment, although only .15% was due to AAPL alone. That's one huge horse pulling that wagon is it not? When the day comes when AAPL starts to underperform, that'll be all she wrote for the NASDAQ, and probably all of stockdom. AAPL is now bigger than Switzerland. I think AAPL has 650 (six fitty) in its sights this week. I stopped out my short on open this morning. 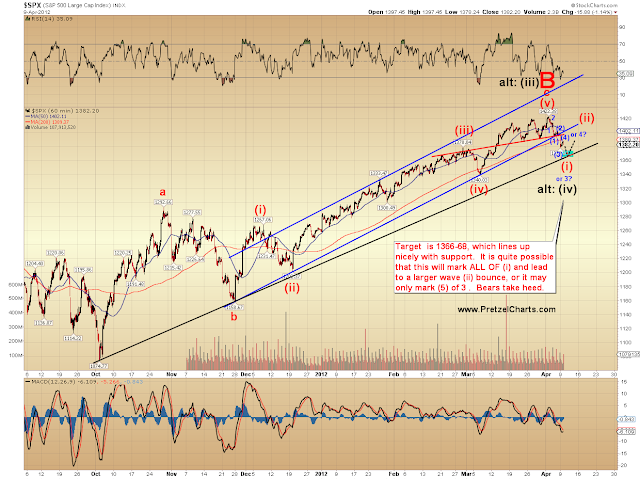 looks like wave 5 has started, busted through PL's first target, so we are going to 1350?? Furrrr- I agree with your sentiments regarding astro signatures. If I would have followed the recommendations from Night Light news and PL I would have saved a trainload of $$$ back in Jan when the retrograde started. Who is the financial astrologer you follow? Bob_E- I think it was you who is very interested in CVX puts. I too think there is alot of $$$ to be made with puts on CVX. I appreciate all your thoughts that you post re CVX. Just curious what strikes and timeframe you are considering? PL- I just started reading your posts a couple of months ago. They are absolutely amazing. Detailed, easy to understand (especially for those new to EW) and completely objective. As I stated above I would have saved sigificant $$$ if I had started reading your work in Jan. You have a new avid follower. ur welcome Bob_E, so now you have some info, are we going to the stars here? per ardua ad astra (RAF motto) would seem appropriate. R2K futures printing lower lows this morning, very weak. ES right at yesterday's lows, NQ100 futures slightly above but on its way down. Overall ST bearish. It's just the default avatar, as I'm using openid and don't know how to adjust it...it shows up as an arrow around a circle for me, si that what you see? So... you are telling us to cover our shorts and wait for AAPL 1000? 1350 would be very very bearish - violations of long term trendline, 50d ema, and price supports at 1370. 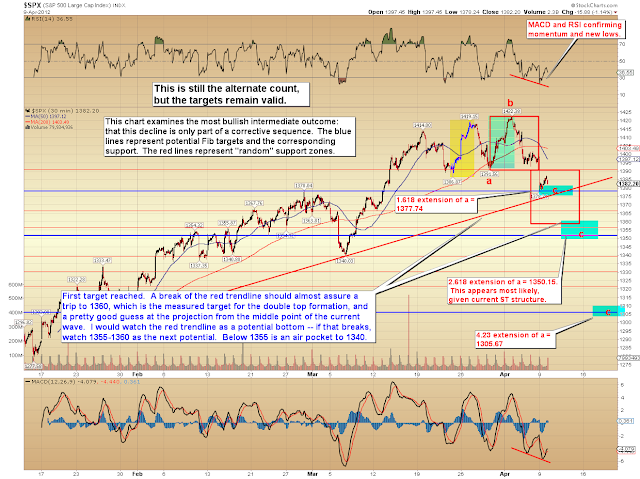 I think 1370 would be a better swing low - keeps the bulls convinced they are in charge. Not sure how likely that is - the charts would have to trade pretty narrow to do that and keep within PLs preferred count, if my read on it is correct. Shorting AAPL is something out of my radar for the moment. I believe that other rockets are more suscetible to stalling soon. If I had to pick a candidate, PCLN would be it - trading at more than 37 P/E ttm now (AAPL is around 18). Good morning BOB-E; Did you jump on the CVX downtown bus? It looks like it is heading south towards the 101 freeway! Please forgive the newbie question. What exactly is an indicator candle? Well good doctor, I am leaning towards higher highs after the 2-3 week correction here. I am in the camp that the sell in may guys and gals will be inflamed as we reach new highs into the election. I'm banking on a hold at 1340 SPX and then up again. Nothing to do with stars, or EW, or tea leaves. Cycle analysis done by a good friend (relationship dating back to 1978) suggesting that outcome and has rarely been wrong. If you use Skype, and who doesn't , I'll be glad to send you a copy of his report/analysis and he'll be constructing an analysis of the VIX within a couple days and I can send that along as well. I think I can see your ascot blowing in the wind. MM, stochastic momentum has entered the 'buy' zone in SPX and INDU so there isn't much more down to come. Maybe. I follow Ray Merriman at mmacycles.com. However, I apply my astro knowledge and EWT on top of what Ray is saying because I've been ahead of him more than a couple of times at the corrective waves - especially summer 2010. Ray puts out a free weekly column and offers subscription services, books. etc. Furrrr- I agree with your sentiments regarding astro signatures. I think this is just another tool to add to your Tool Box for deciphering markets. If I would have followed the recommendations from Night Light news and PL I would have saved a trainload of $$$ back in Jan when the retrograde started. Who is/are the financial astrologer(s) you follow? No I did not...missed the bus. I was so conflicted after that last drop (can't tell if it was just emotions or schizophrenia) so I've been sitting on my hands. I've got to learn to trust others....not everyone, just PL. Hope you're sitin pretty and enjoying the ride. sell house, buy AAPL, no brainer. "We Brits"? Judging by your handle I always thought you were a New Yoahkah. But American's generally don't say "spot on". Brits do though, lol. Let me guess, you're a British ex-pat living in New York? A doji form, twin pipe, hammer, etc. I agree you have to use a as many tools as possible. Thanks, I will check him out. Big thinkers tend to do that....scratch the top of their head. I don't it actually itches, I think they are making sure their hard drive is still there cuz it looks/sounds like others have lost theirs. Well I have to be at work in 10 minutes and it's a 30 minute drive, so I think now that my puts are closed out and I'm all cash, I'm going to stop watching the tape and go to work. That's what I thought, a reversal indicator. A couple more questions, if you don't mind. What timeframe do you use to look for an indicator candle? If you're waiting for the TL break, then the indicator would be slightly in the past, correct? Got to watch PL here RitchieMac. I became rather conflicted during this last drop and watched from the sidelines. I am short XOM from $86.81 and feel comfortable with that one....but became somewhat unglued when CVX started dancing to another tune I wasn't familiar with. I'll get back in the game as soon as I have a few "right calls" PL uncovered this treasure....he's the man to watch. well actually I still live in the United Kingdom (=UK) and my initials are DNY, that's it really, but I'm very fond of NYC, great place. What does exercise me is that AAPL being so important if it DOES drop the markets will surely drop too and right now I'm looking at a bounce so, not dead yet AAPL, but surely that is an ending diagonl up there? What do you think? Sorry you have to do that MM. Necessary evil though. Thanks for the info. I closed out some short with the whoosh down, hopefully can pick them up again later at cheaper price. NDX is not as weak due to AAPL, but RUT is extremely weak this morning, which one is telling the truth?? I agree UKDNY. It could bounce from here. AAPL products will soon be used as constuction materials, that's what the catalyst to the 1000's is...iPad's are better than wallboard :), although both are constructed in China. 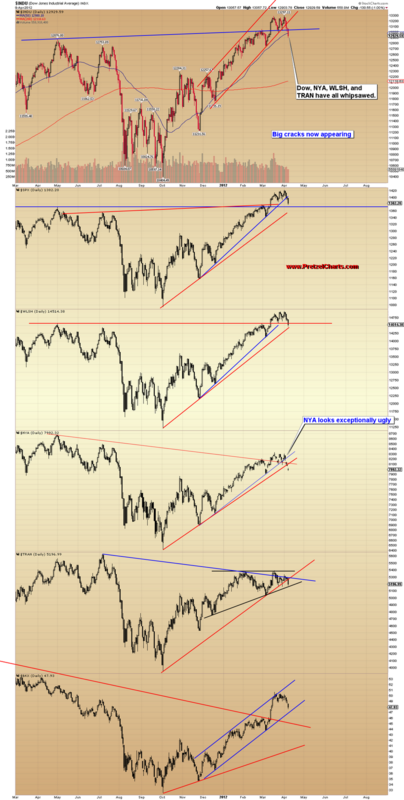 NDX hasn't made a new low but the others have so suggests a bounce is imminent? Looks like a wv1 with 62% retrace at the moment. Course, things might change but looks bullish for NDX. If we look at a chart as small as a 10 or 15 minute, then yes it sure does look like an ED way up there on the tip of the tip of the arrow. But when I look at it on a daily chart with moving averages, I just don't see anything that suggests it's about to drop. Except for the negative divergences all over the place. But the trend is up in AAPL so 'bull rules' apply, meaning we ignore overbought indicators and use oversold indicators for identifying good spots to enter on the long side. So until some basic moving averages like a 6 day roll over, really I just gotta say that even though AAPL just seems so incredibly huge that it 'has to' crash... it really doesn't. It's not even that expensive on a P/E basis if I'm not misnaken. Not to mention that we need to see some sort of trend line break... any trend line break, lol. So even though I'm bearish, I have to admit that I just don't see any cracks in AAPL at this time. I expect AAPL to (perhaps not this Quarter) begin to show some margin deterioration. I would expect the market to not react too kindly to that news. Perhaps that being announced or being rumored, or given some credence, will be what stops AAPL's amazing run. Perhaps I'm way off too, time will tell. Katzo, target hit on ES 68/69, what is the rebounce target? Not sure, UK. ES and R2K printing lower lows right now. More important, the disconnect between NDX (QQQ) and AAPL is intensifying today. I would not discard a bounce from here, but things seem to be getting uglier. 2739 and 2751 are the NDX futures levels I am watching now as reversal points. AAPL filled the opening gap on the hourly chart. It might have whip-sawed me out of my Bear Call this morning, which, if true, is very frustrating. I thought spx 68/69, es63-65? I agree GPitt, however the relatively low volume of PCLN makes me too nervous to trade it. It burned me big time a few weeks ago. It's very susceptible to manipulation. I prefer the price and volume of GOOG and AAPL for credit spread candidates. Spain and Italy bond yield surge recently..... Italian 10 year bond yeild surges over 4% today.....http://www.bloomberg.com/quote/GBTPGR10YR:IND. It looks like LTRO effects only last 4 month. PL Either I sent you two donations of the same amount or one donation, on the first try it looked like it accepted it but I was not sure, went back and used the same card for the same amount but it rejected the card so I used a different card which it appeared to accept. Correct, I agree. Did not mean that I would pick PCLN right now (it is touching the upper BB), it is just a "candidate" for now, but in a confirmed meltdown scenario PCLN would be a good candidate for some speculative puts, the collapse shall be pronounced. I just covered my shorts. But that was just a day trade thing. Yeah, I'm really a bit conflicted right now because we're not seeing any weakness in AAPL, nor are we seeing it under-perform the NDX. In theory, AAPL could be rising but the NDX rising even faster. That would cause the AAPL:NDX ratio to start to head lower, and if that happened, even though both were rising, it would not continue for long. Maybe a few days and that's it. That's what the AAPL:NDX ratio study shows. But far more likely would be the case where AAPL either goes flat or starts to drop, if even by a very small amount. In that case the NDX would surely be dropping because the other 99 stocks in that index are basically going nowhere or falling. That's the scenario we're going to need to see... AAPL under-performing. Right now we're not seeing that. I just watched a fund manager on TV on BNN and he was stating the very same thing... that in order for the stock markets in general to really get into a bearish groove, he expects that it would be the NASDAQ that really takes a dump and leads the entire decline. I'd have to agree with that. OTOH, I'm also playing with the RUSSELL on the short side and having some great success with that because small caps also lead. So... mixed signals at the moment. Great post AR. I think your AAPL analysis is right on, or spot on for UK :). AAPL bull put spreads have been my bread and butter this year. I've failed on 2 attempts to front run a retracement, and I've succeeded trading some retracements as well. In hindsight, I don't know why I thought AAPL would follow the overall market this week. Bad call. You can call me nuts, but from what I capture in the options environment I would not discard an AAPL move back to 600 within few days, maybe next week. It would actually be a healthy retest of its 20-day MA region (central BB area). I am not saying it is likely, and will not dare shorting this thing anytime soon. TLT up another 1% today.....looks like a three wave to me. Bob I agree. I loaded up on CVX puts a few days ago. I think it broke a key level today although it has trended back up. PL had indicated a sigificant resistance level at $101+. I need to pull that chart and look at it. Maybe he will do an update on CVX today/tomorrow. My concern now is how long to ride these puts. From I can "objectively" see, CVX is in the third wave down, not the fifth wave down. If you calculate the first decline of $7.43 and then multiply that by the typical wave three length of 1.618....you arrive at $12.02. Subtract that from the two wave high, which could be $108.79 and it takes you into the $96-$97 range. (PL indicated that in the post) Now...option expiration I think is the only thing you have to be concerned about. Is that blood on the end of that fork jb? Many thanks for the numbers. PL had on the chart yesterday that the alternate count is ruled out at $101.30 and if I understand this correctly a break of that level would definitely mean CVX is in a third wave down as you said. Make sure you're going all the way through the process -- after you log into PayPal, there's another "send" button you have to click for the transaction to go through. 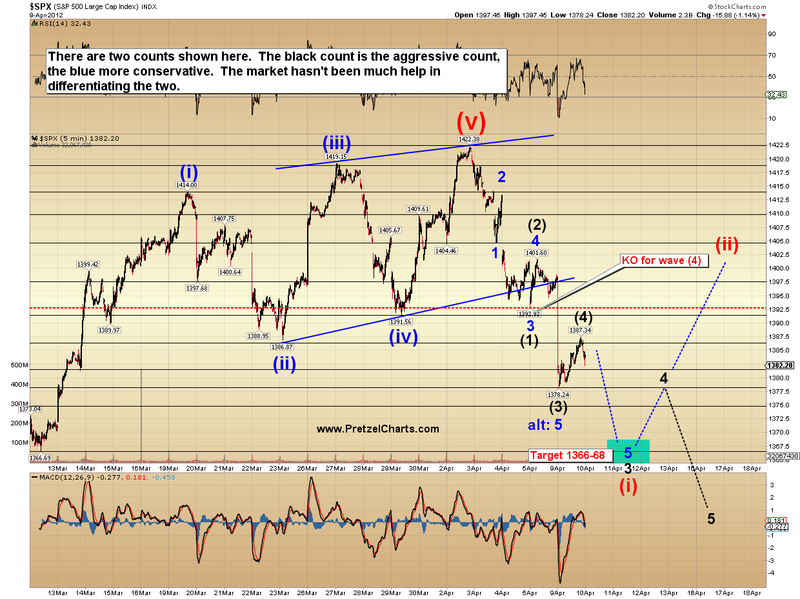 wow the market is dropping like a rock, with no rebound in sight, wave 5? It's possible that this wave down is only a little more than half-way done. Damn, I wish I could give you a link to the article I put together back in FEB. It paints such a clear picture of what it is that we need to see. I'll try to add it as a reply to my own comment. If I add it here, this comment will almost certainly vanish. was this iii of w5 & still v of 5 to come today? wondering where Katzo is today.. too busy shorting I suppose? good time to be out of the market, especially if you were long. what is the target if the whole wave is done? I'm not advocating getting careless here, by any means -- all conservative targets have been hit. 101 for CVX, 1366-68 for SPX. But remember how overextended this market got to the upside... and realize that we could see the flip side of that now. Enjoy the view.....others here are makin money and taking it away from the big boys. What is the ES that many are tracking? FX and gold are not really confirming this downdraft in equities, i guess something is up?? You said the wave is only a little more than half wave done, so what do you think the target might be if the whole wave plays out? ES is the E-mini S&P 500 futures contract. yep, excellent post AR, AAPL 'has to crash' just like 'INDU has to bounce from hereabouts' I posted earlier lol, AND I'd sold off my shorts,... hind-sight eh? where would we be without it. Tell you what though, that red candle is the biggest for months, so from now on, short only, I feel long might just be suicide. Interesting numbers.....CVX has a first wave down from $112.28 to $104.85, or $7.43. Subtract $7.43 from possible wave 2 peak at $108.79 gives you $101.36. There is an unfilled gap on 12/9 at $101.33. This is if this wave down is just equivalent to the first wave down.. Okay, gotcha. Well, as I stated a couple articles back, if this is an impulse down, I'd like to see 1340 broken. Just eyeballin' it, 1320-1330 seems do-able IF, and only if, this is the mid-point of wave 3, and not wave 3 of an extended fifth. katzo: so what's your next tgt? When do you plan to cash out your TVIX? NYA has already broken the March lows *and* the October highs. SPX appears headed to at least 1350-55 before any meaningful bounces. When I grow up...I wanna be just like him. Where'd I put that SPF 25? lol, you guys are a riot! This type of market where bears are afraid to stay short is exactly what's needed for strong moves down. Once all the bears pile in, the short covering acts as very strong support in a down market. Suggestion: Re-subscribe to email updates. Thanks PL. I'm sure you're exhausted but we really appreciate you jumping in with info like this. 'zactly. That's one of the reasons why bear markets don't happen when everyone's bearish. They happen when the majority of bears have capitulated (or gone broke) and given up on selling the bounces. PL, I see a link to OptionsHouse now. Do you get anything if I fund an account? I've had a practice account there for a while. I'm leaning towards OX though because no futures on OptionsHouse. Thanks for the suggestion......I have and they are coming through today. Must have been the sun spots. Someone asked yesterday about ES data. You can get tick data here going back about 3 years, but I think it only has RTH data. giarc, thanks for asking -- I believe you have to actually *open* the account through the link for it to count as my referral. If you already have an account there, then it probably goes to whomever you linked in through the first time. If I understand you correctly, you are implying that there is no short covering to slow this move down, and it is being left only to the dip buyers to stop it if/when they decide to? Which Swiss bank do you use? Might be a decent-looking little bounce coming here, but I doubt it's "the" bottom. Seems to be the case, yes. Most bears seem to be late in, early out -- so the move can continue. Whenever they're late-in, late-out, it will bounce more strongly. "... so from now on, short only, I feel long might just be suicide"
there "should be" some serious support right about at 1365-70. Or at least "should have been". So even though I'm pretty confident that little long position I took this morning will pay off tomorrow or Thurs., I also think we're probably getting to the point where to be long is almost suicidal. Short only from now on except perhaps for the occasional scalp with a very small position... one that can return 50-100% in a day or two (cheap calls). decline is finished... I think. I know you're off to bed / tending to your positions, so feel free to comment later/tomorrow's update but I'm still curious about the alt. count (call me a glutton for punishment). You had written some comments around that such as, "If the first large impulse down cannot break the 1340 swing low, then we will assume the alt count is probably correct". So you are thinking a pause / bounce here then resumption downward to break 1340 swing lows? Count me as one of the bears too scared to stay short for long (but finally seeing some green today after many stop-outs recently). Today's low of 1359.28 seems right in the middle of your black alt iv target box from yesterday. Whenever you have time to elaborate (not now, focus on trading)..., I'm confused by this statement: "Most bears seem to be late in, early out -- so the move can continue." Lol! that's one of the better one's I've heard. That was me, giarc, and I appreciate much your reply. I am downloading the file as we speak (have not seen it yet) and will get back with comments soon. Thank you! it hit down 180 $INDU, then down to 205 ish I think, back to 180, now down 200, be interesting to see where they parke this bus EOD. Yeah, me too. What evidence is there? I opened few files and, yes, the samples I opened cover only regular trading hours. I appreciate your contribution regardless. Thank you again. QE, can't you see what's happening?" 1) crap, why did I close out those puts?! (Incidentally, I've been doing really well lately getting into trades and getting of losses before they become big, but terrible at letting my winning trades ride). 2) Must be 5 of V! or V of 5. or v of V. or... you know what I mean. Time to go long and let the dead cat go elastic. So I jumped in my car and raced home... Unfortunately when I took a look at the chart I was so sanguine about this being short term bottom. Plan is to sell put spreads (don't want to do calls and get vega'd when the market goes up). But the pattern isn't obviously complete to me like I thought it would be. Judging by the posts, everyone has been burned at some time, bulls and bears both. It is interesting, to me anyway 'cos I have an interest in how people think etc, how these myths propogate, 'no-one went bust taking a profit' v 'don't leave a profit on the table' and so on. I've heard both from the same person. Taleb (Black Swan) loved lots of small losses in order to catch the big one so he traded and made losses frequently, made enough to retire on one big crash, Prechter says not to do so 'cos you'll lose the big trades, trade and hold, won many best trader prizes (Buffet too) All made shed loads with their own strategy... I'm risk averse, so I sleep very well... :). Works for me. Those were my thoughts also..."Let's make them need us." Ben likes being a hero. As much as I want to, I can't look at this and call it the bottom of a 5 wave impulse from the high. If we're in wave 5, then wave iv might just be beginning. If we are in (super bearish possibility) wave 3, then still at best we're in wave iv of that. Thanks. Yes I'm sitting tight but it's killing me. Better go play more Mass Effect before I get too creative. I am not asking for evidence... I just don't understand how bears can be "late in, early out" and how this makes the move continue. I definitely understand "Whenever they're late-in, late-out, it will bounce more strongly." That makes perfect sense. Hi AR, thanks for the comments. If making 100% on one trade leaves you a bit sore you took off too early, you need some therapy! Some would DIE for 100%, me included. Give thanks it wasn't 100% loss ... lol . Going long? Nah, I want to sleep nights, and I never trade overnight, this market is a killer overnight, been there - done that, wrote the book. There's lots of gaps up top to be filled so I'll be trading those short, until then, I'm going to play with my grandsons... my best investment. Surely not Bob_E, surely not. You surely aren't expecting these markets to print new highs? Tell me you aren't !! I hate going to the bank, unless its just to say "Hi". The free lollipops just don't cut it. cracked right thru' everything K7. I think you almost mentioned "he that shall not be named". one-armed paper-hanger over here. Please post the video PL, gotta see it lol! Sore? Not! I'm just a bit prouder of myself for having had the discipline that I did... for a change, lol. It's all good. And it's gonna get gooder. To be looking to get short somewhere up near the gaps (if the markets get there) definitely seems like the way to be thinking. I should be able to cash in a little more green tomorrow and shorten up again. Enjoy those grandsons. I don't have any yet and if my own two kids don't hurry up and have some children I'm likely to get out there and make a few more of my own, lol. My favourite place Bob_E. There's a building there no bigger than a duplex, no-one going in or out, very quiet:- 3,000 company name plates outside ! Tax dodge or what? We were there once when I noticed every shop had a /12 price sale board outside. Told my wife so we went shopping next day. All gone. THEN I noticed the cruise ships were in. You with me...? wne tot the local mall the other day, most places almost empty, Apple store? queuing to get in... bizarre. What IS the attraction here? Overpriced, underpowered, too heavy, too hot, locked in to software. Bizarre. Not short, not long, no position. I'll sleep easy tonight. Good post A1, good post . 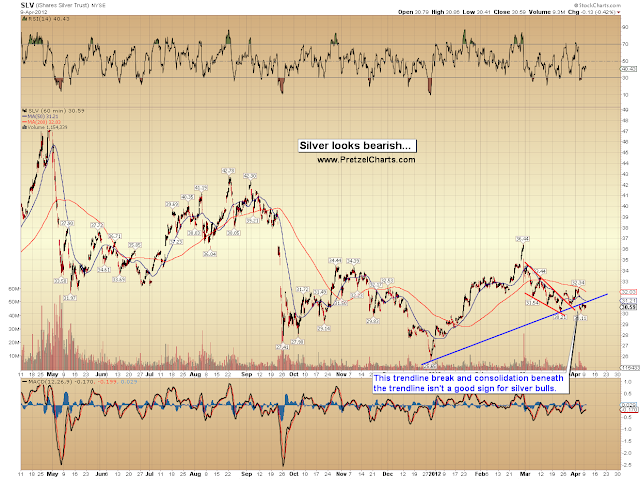 Any thoughts on SLV gaining today and closing above 30.72? Does this change the bearish view at all? PL reckons (if I read him right ) some more down to come so it'll be a while before we tuirn up, but corrections tend to be choppy and whippy so I stay out of them, can catch a BIG loss in a short time in corrections. Impulses like today are a dream, if caught!!! Natch. Straight down. Boom. Yup. Patient does pay off. Wait for TL break, gotta play the rules guy. Buffet hasn't really made money "trading"....he admits it himself he is a terrible timer. Good example is his purchase of 6 million shares USG back in 2002 at $3.50. Watched it go up to $100 and never sold a share. Watched it go right back down to $6 in 2009. He still owns all the original shares purchased in 2002 and has added to the point of owning 17 million shares now. Last dividend on the stock was paid in 2001. So it wasn't the income stream he was looking for....He is a buy and hold guy! Clue me in...who shouldn't we mention? Don't want to do it by accident. Some apprehension if this is real or not, I think it is real. 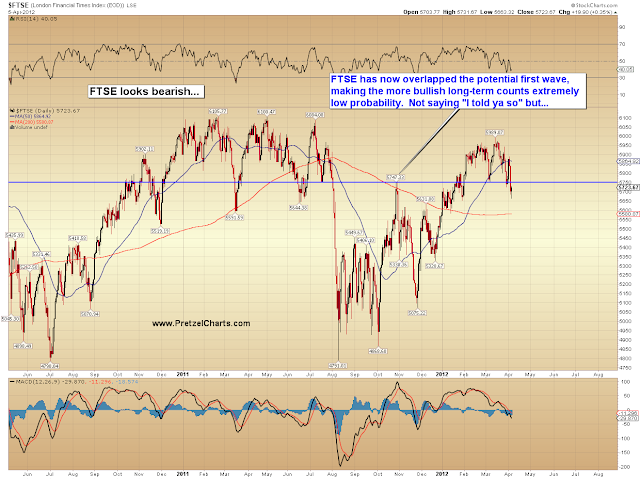 There is usually this apprehension at the beginning of the move, IT, the rounded top whipped both bull & bear to death. Still do not know if this is just an EW4 with a higher high to come or the beginning of something more horrific.